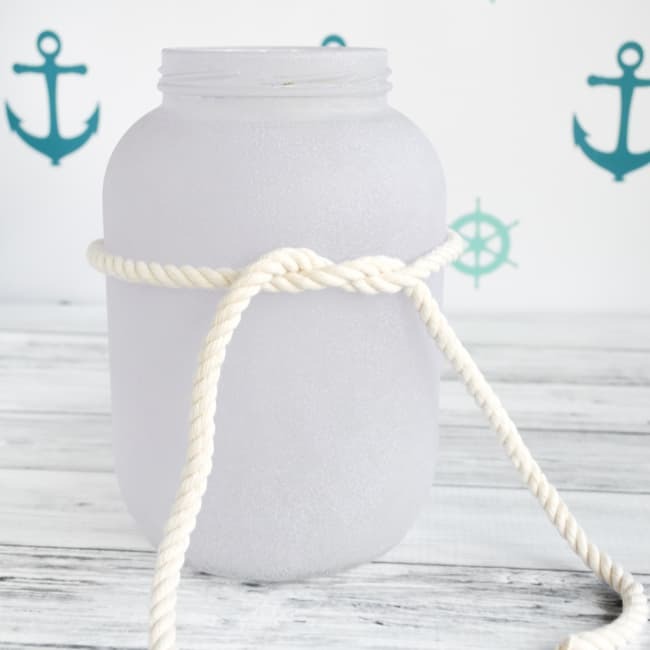 This up cycled frosted sea glass jar is such a great way to inexpensively add a nautical flavor to your decor! Do you ever find yourself hoarding “cool” things because they “might be useful?” Yeah, me too. It’s really difficult for me to toss out perfectly good glass jars from pickles, olives, jelly, etc. because they seem so darn reusable! Sure, I frequently have no idea what I’m going to do with them, only the strong feeling that something will come along one day. 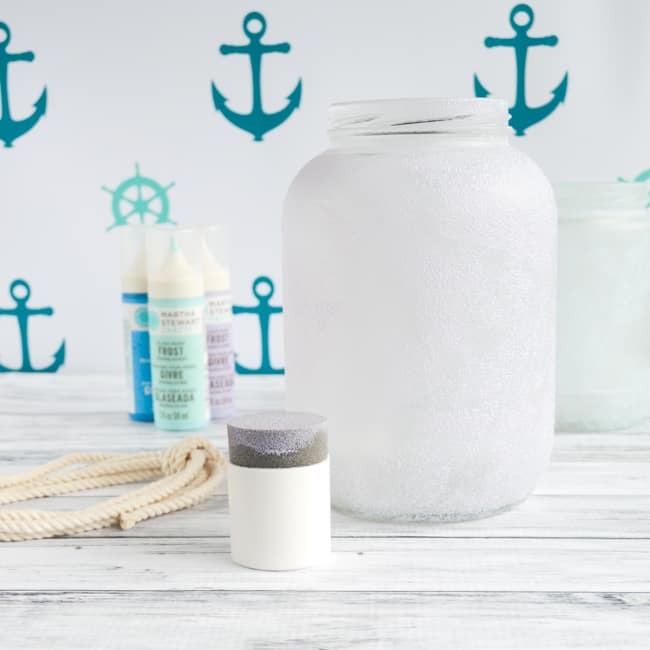 These frosted sea glass jars are really easy to make and only require a few materials! 1. Make sure your jars are both clean and dry. Any oily residue, bits of dry food, etc. can cause the paint to either not stick or come off later. 2. 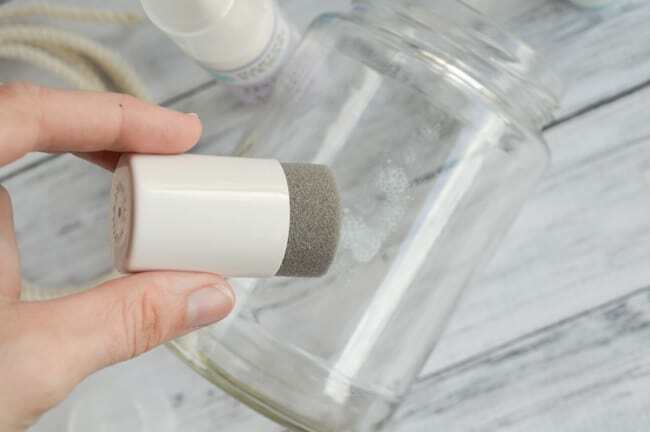 Pounce the frosted glass-effect paint all over the exterior of your jar. I found it easiest to hold the jar carefully by the lip, or to simply put my hand inside the larger jar so I could paint around the whole jar at once. I only painted the sides, not the bottom, but you can do whatever you’d like. 3. Allow the paint to dry and then apply an additional coat (or two or three) until you’re happy with the coverage and depth of color. I’ve worked with frosted glass paint before, and I’ve realized it’s better to apply two or three light coats than to try to apply one thick one. I’ve also noticed that the color gets more vibrant the more coats you apply, so you can make pale, barely-frosted jars with one coat and more colorful jars with two or three coats. Just do whatever you prefer! The jar shown below has one coat of (wet) paint, and you can see how much lighter the color is than on the finished jar with two coats. 4. 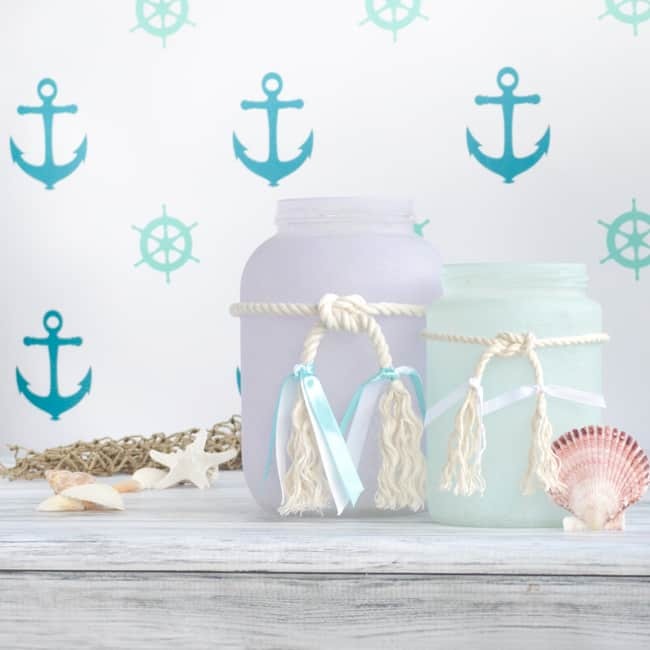 After you’re happy with the jar’s color and the paint is dry, you’re ready to get decorating! 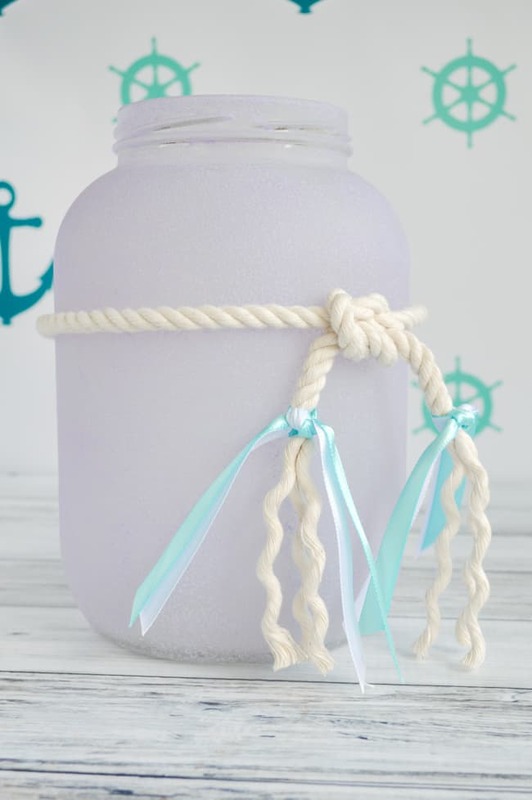 I used 1/4″ cotton rope on the big jar and 1/8″ rope on the smaller jar. 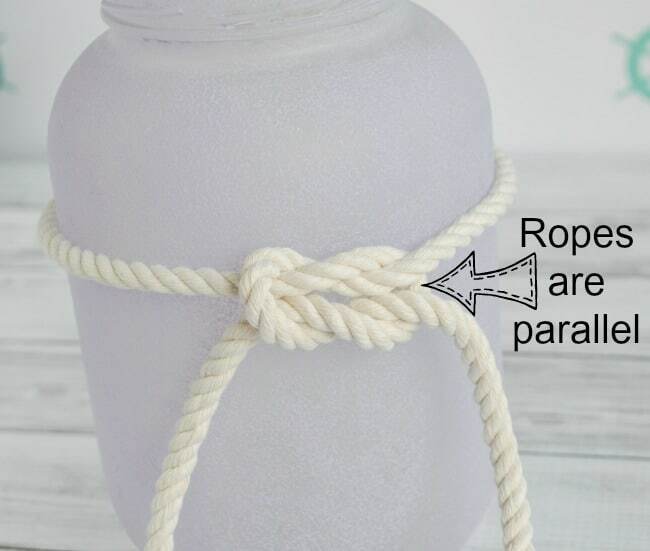 Cut a piece of rope that’s long enough to wrap around the jar once and then hang down to the ground on both ends. 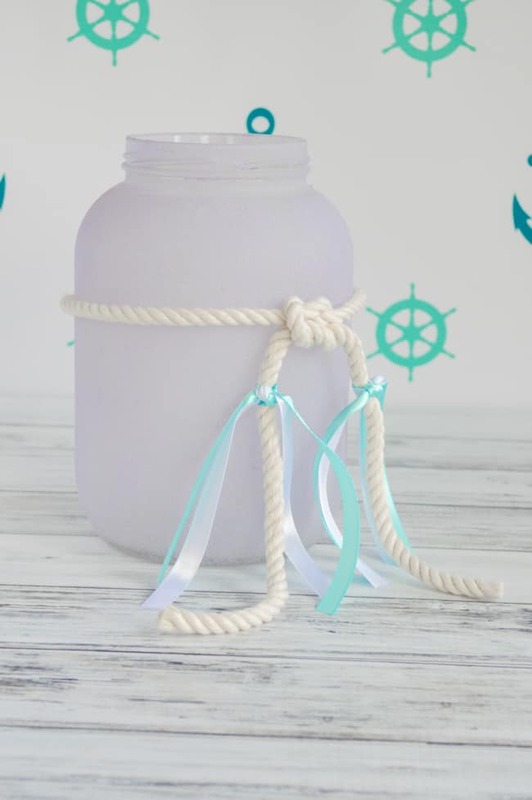 Then wrap it around the jar and tie it in a tight overhand knot (the type of knot you use as the base when trying your shoes). I liked the way the knot looked higher up on my larger jar, but more towards the middle on my smaller jar, so play around with it to see what you prefer. 6. 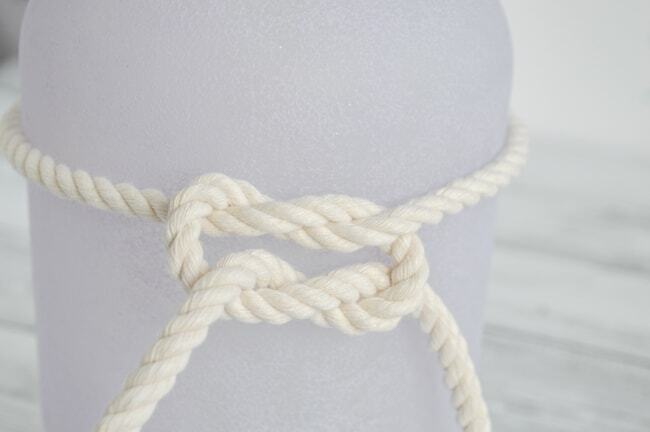 Cinch your square knot down nice and tight. 7. Now it’s time to use your ribbons! Embroidery floss, baker’s twine, rattail, hemp – just about whatever you’d like could work. In this example, I used four pieces of ribbon that were each about 8″ long, but how much you’ll need depends on how long you want your ribbon tails to be. Using a square knot, tie the ribbons very tightly around the dangling pieces of rope. 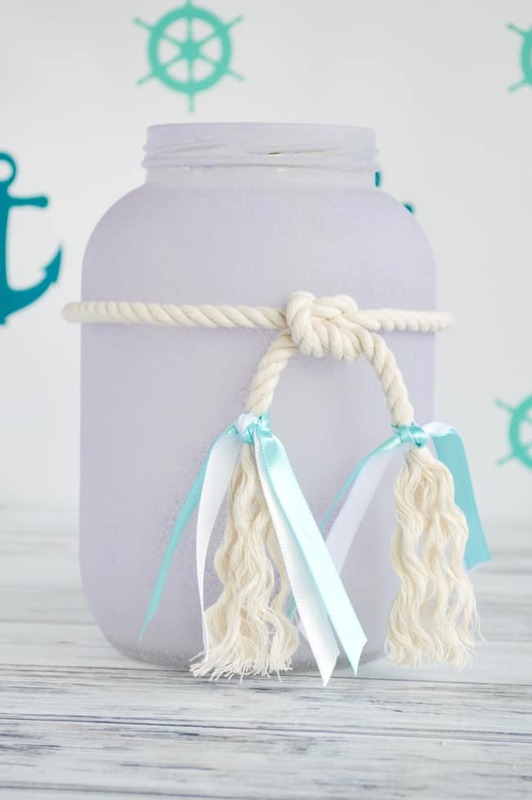 In the next steps you’re going to create tassels below the ribbons, so think about how long you’d like your tassels to be when tying your ribbons in place. 8. Trim up the ropes and ribbons, if you want/need to, then untwist the rope’s strands below the ribbons. 9. Next, fray the threads out to create tassels. 10. Do any final trimming and adjusting you’d like. After all the positioning and trimming is complete, you can use a dab of hot glue or craft glue (like E6000) behind the knot to hold everything in place. 12. 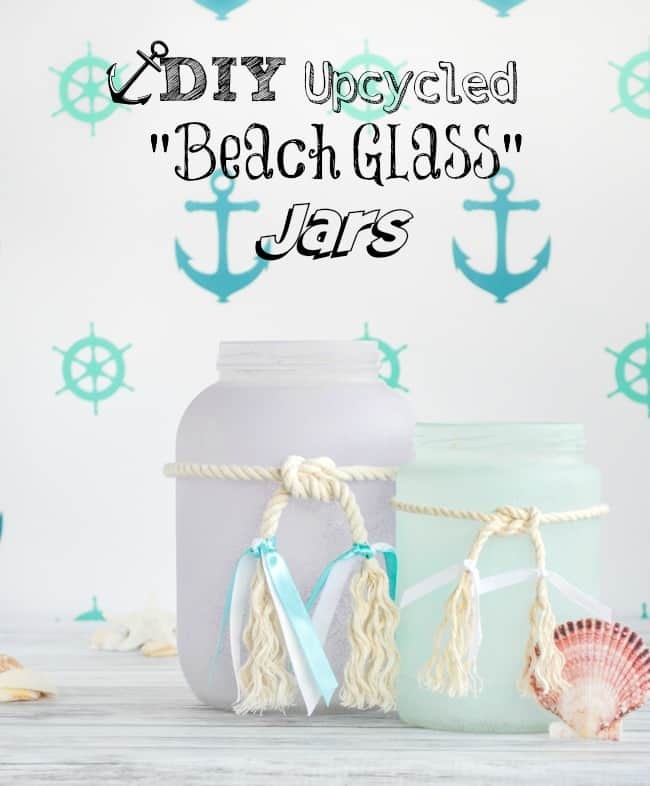 Enjoy your awesome new upcycled beachy jars! 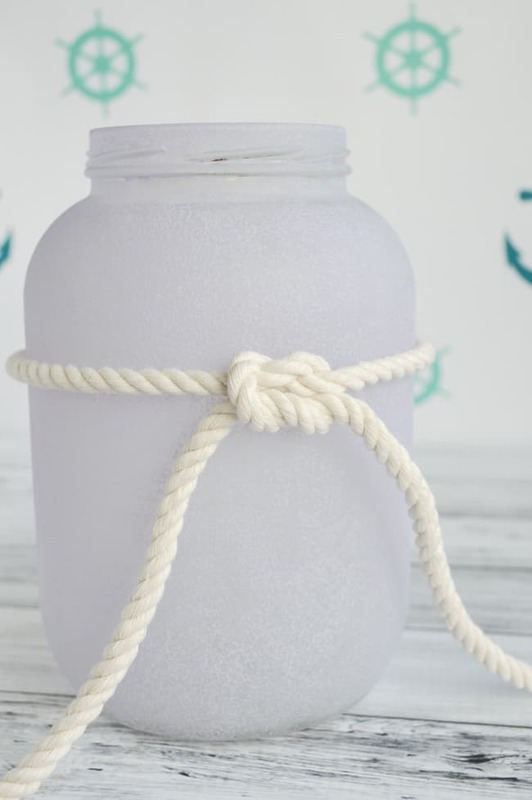 I think these jars are cute as a shelf or mantel decoration, but they’d also work wonderfully for holding potpourri or even a beachy floral arrangement. 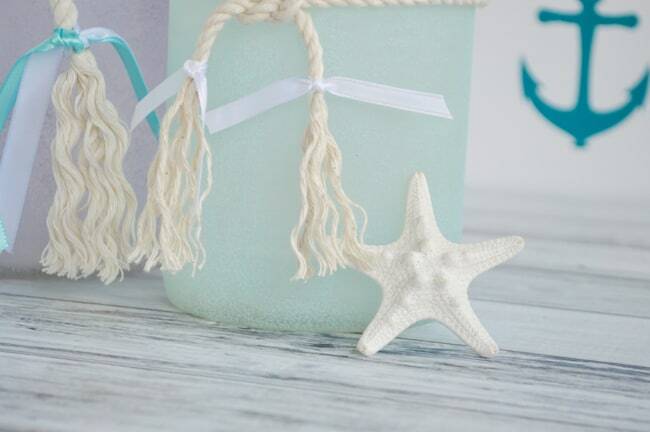 I’m sure this tutorial isn’t surprising at all to anyone who knows me – I definitely like beachy decor! It’s kind of hard to go for anything else when you live in Hawaii and it feels like summer year round (or when the curtains that have to stay with your apartment all boast various Hawaiian prints). Plus, I feel like it’s a style that lends itself very well to DIY projects, and I love making things! 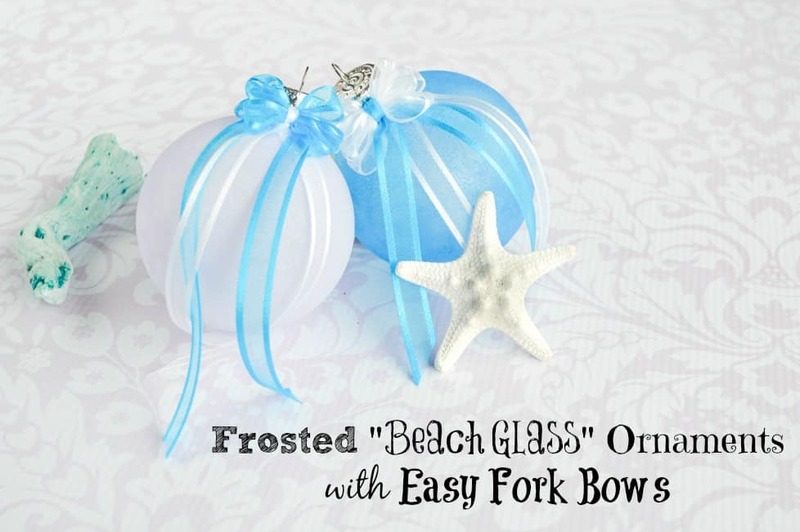 If you enjoyed this project, you’ll also enjoy these cute sea glass ornaments with easy fork bows! Have you added any new decorative accents to your home recently? 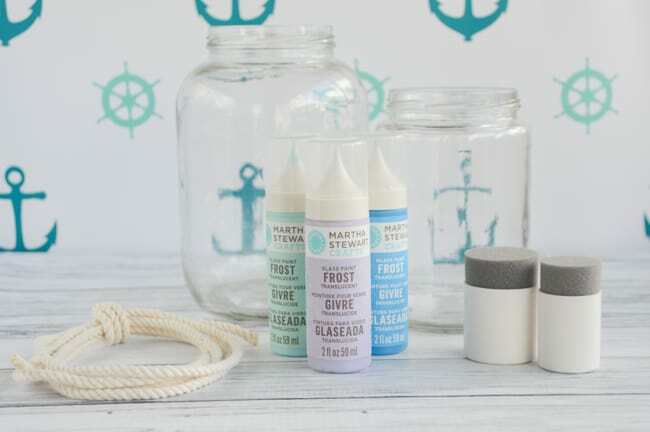 I love your Sea Glass technique from 2015 but Martha Stewart’s translucent frost glass paint is not being manufactured any more. What have you found gives the same soft beautiful effect? I know DecoArt has a frosted glass enamels paint line, but I haven’t tried it yet because I still have leftover Martha Stewart paints. I have seen a few individual frosted glass paints from her line available on Amazon recently, though. I’m sorry I can’t be more helpful!